The art of bronze casting dates back to at least 2000 B.C. in China. During the Shang dynasty large ceremonial urns and food vessels were constructed for the emperor using the lost-wax process. Complex hollow forms with elaborate surface textures could be created by casting the durable alloy bronze. Ryden Arts continues the same ancient tradition of lost wax casting but incorporates modern technologies to support contemporary concepts. 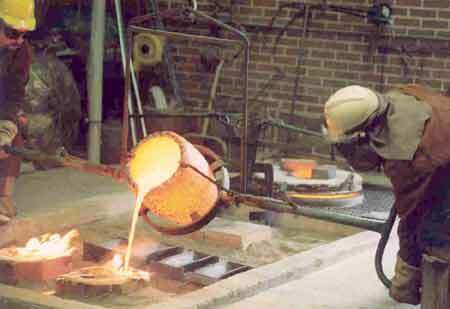 Although mastering the art and science of bronze casting is a complex task, the explanation of the process can be stated simply. Essentially, the lost-wax process is a substitution process. 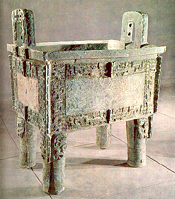 Chinese Shang dynasty ceremonial "Ding" vessel, 2000 B.C., bronze, weighs 1800 lbs. 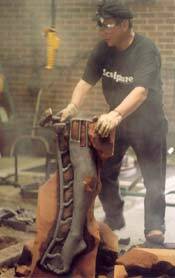 Pouring bronze in the foundry, 1600' F.
First, a sculptural form is made in a moldable material such as clay. Second through a mold-making process the intricate details of the original are replicated as a hollow wax form. Third, this form is then encased in a foundry mold which can withstand high temperatures, and the wax is melted from the mold in an oven. Fourth, the "lost wax'" leaves a cavity into which molten bronze is poured and so takes the exact shape of the original model. So in summary, the bronze form is made three times; in clay, then in wax, and finally ..... in bronze! Ryden Arts also creates sculpture in a variety of other media including stainless steel, aluminum, and stone. These materials are often combined to interact with water to create fountains for public and private environments.